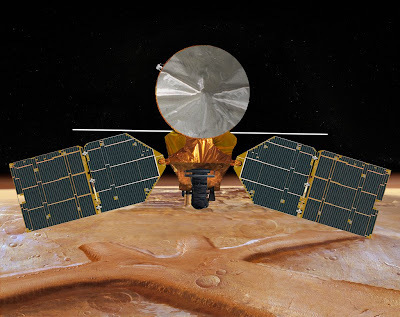 The Mars Reconnaissance Orbiter (MRO) is a multipurpose spacecraft designed to orbit Mars and conduct reconnaissance and exploration of the red planet. The spacecraft was built by Lockheed Martin under the supervision of the Jet Propulsion Laboratory for US$ 720 Million. The craft was launched on 12 August 2005 and reached Mars orbit on 10 March 2006. Upon reaching orbit, there were five other active space craft and vehicles on Mars. These are the Mars Global Surveyor, Mars Express, Mars Odyssey, and two Mars Exploration Rovers. Upon arrivla, MRO began collecting data on the history of water on Mars. The on-board instruments took extreme close-up photography of the martian surface, analyze minerals, look for subsurface water, trace how much dust and water are distributed in the atmosphere, and monitor daily global weather. Last year, images from NASA's Mars Reconnaissance Orbiter captured sand dunes and ripples moving across the surface of Mars—observations that challenged previously held beliefs that there was not a lot of movement on the red planet's surface. Now, technology developed by a team at the California Institute of Technology (Caltech) has allowed scientists to measure these activities for the very first time. "For many years, researchers have debated whether or not the sand dunes we see on Mars are fossil features related to past climate, since it was believed that the current atmosphere is too thin to produce winds that could move sand," says Jean-Philippe Avouac, the Earle C. Anthony professor of geology at Caltech, who initiated the study. "Our new data shows that wind activity is indeed a major agent of evolution of the landscape on Mars. This is important because it tells us something about the current state of Mars and how the planet is working today, geologically." The team focused on precise, subpixel measurements of movement between pairs of images. On the dunes at Nili Patera, the software automatically measured changes in the position of sand ripples from one image to another over a 105-day period, resulting in the surprising findings that the ripples are moving fast—some upwards of 4.5 meters during that time—which contributes to the total motion of the sand dunes. This is a perspective view of Nili Patera dune field: The HiRISE image has been draped over a digital elevation model of Mars. Colors correspond to the amplitude of the ripple's displacement extracted by image correlation between two HiRISE observations separated by 105 days. Cool colors (blue) correspond to less than 75 cm of displacement whereas warm colors (red) correspond to 4.5+ meters. "This is the first time that we have full, quantitative measurement of an entire dune field on a planetary surface, as opposed to the localized manual measurements that were done before," explains Francois Ayoub, a coauthor of the paper and a scientist engineer in Avouac's lab. 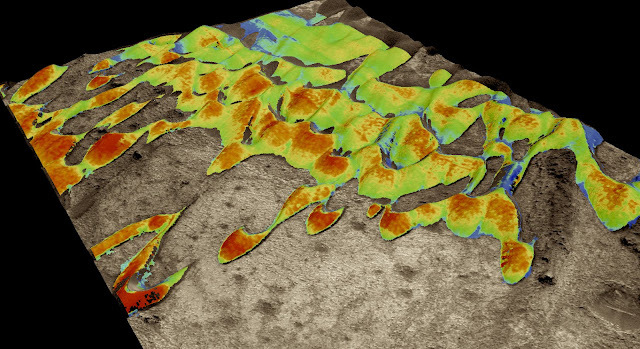 "Using this technique, you could monitor other dune fields, or you could also follow a particular area over a longer time frame to see the seasonal or annual evolution of the sand dunes. This is a huge step in terms of the data that you can obtain from the surface of Mars." The team also found that the dunes at Nili Patera appear to move similarly to those found on Earth in Victoria Valley, Antarctica. This implies that the rates of landscape modification due to wind are similar on the two planets. Interestingly enough, getting these measurements was much easier on Mars—the researchers could not quantify dune ripple migration rates on Earth using the same technique because that would require satellite imagery of our planet at a resolution that makes it classified information. "These new measurements provide keys to interpreting the landscape and the stratigraphic record that you see exhumed when you look at the imagery—we see sediments and wonder what they mean in terms of the past geologic history," says Avouac. "The fact that you can describe the current activity of surface systems will help us understand Mars's past geological record, which is a reason that this is important." "We would like to use this new data to tie our observations to the physics of sand transport, which are not well understood," says Sebastien Leprince, a coauthor of the study and a senior research scientist on Avouac's team. "By learning more about how the sand moves around, we may also learn more about the atmosphere on Mars." "We are going to visit other areas on Mars to get a better view of what kind of activity there is on the planet today—geologically speaking, of course," says Avouac, who points out that while they are not looking for life on Mars, their technique is detailed enough that it would detect very small changes on the surface.